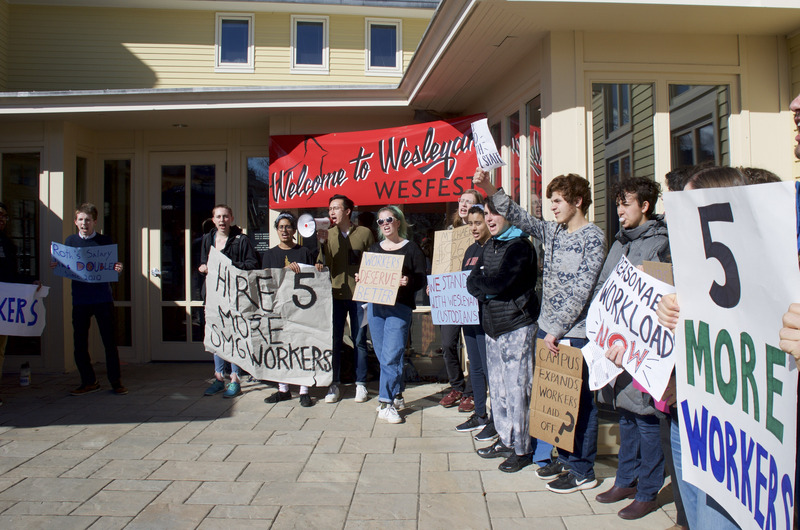 Members of the United Students Labor/Action Coalition (USLAC) and other students began a series of protests outside the Office of Admission at 8 a.m. on Wednesday, April 10, the first day of WesFest, to demand that the administration, specifically President Michael Roth ’78, hire five more custodial workers. Protests continued into Thursday, and involved students have stated that they will not stop protesting until the University meets their demands. 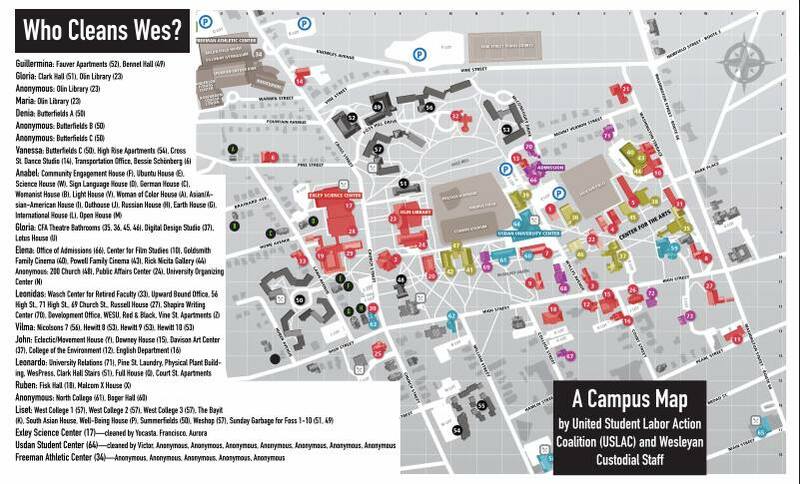 Since October, when students protested the firing of custodian María Sarabia, members of USLAC have been advocating for the hiring of five more custodial workers. 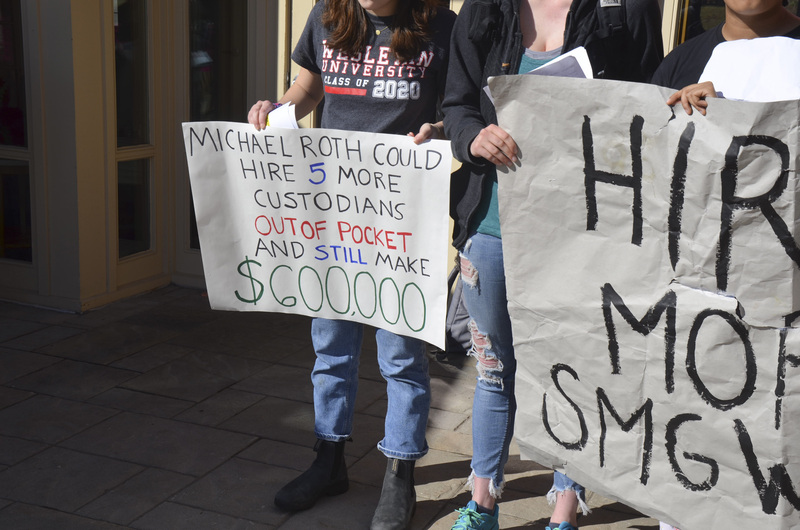 This demand intends to address the 10-person reduction in the University’s custodial staff—which decreased from 60 to 50 workers between 2012 and 2014—after Service Management Group (SMG) won its bid for the University’s custodial labor contract. According to custodians, this reduction in staffing has resulted in unreasonable workloads. The students that gathered outside the Office of Admission on Wednesday morning blocked the two main entrances to the building before being approached by Public Safety officers. The officers told them that they could not block the entrances, as they had to allow prospective students and their families to enter and exit the building. Protesters then moved to the sides of the two entrances, where they led chants in Spanish and English and held signs with different messages directed at the administration, including “Students Stand with Custodial Staff,” “Reasonable Workloads Now,” “Justice for Janitors,” and “Michael Roth $926,183 a Year,” referring to Roth’s annual salary. Students also engaged with prospective freshmen and their families by handing out “Who Cleans Wes?” maps that listed campus buildings and the names of custodians tasked with cleaning them. Shortly before 9 a.m. on Wednesday, several students at the Office of Admission went to Beckham Hall, where Roth was slated to give a speech for WesFest attendees. Carrying various signs, protesters silently stood in front of the stage and handed out maps. Vice President and Dean of Admission and Financial Aid Nancy Meislahn introduced Roth, who spoke while walking through the crowd instead of from the stage. The protestors then moved onto the stage and continued to stand there throughout Roth’s speech. Roth made a few joking mentions about the protesters, noting that although he disagreed with them, they were a sign of Wesleyan’s strong activist culture. The speech ended with a Q&A, during which a member of USLAC attempted to ask Roth a question. Roth did not engage with the USLAC member, instead ending the speech and encouraging people with individual questions to approach him afterwards. Immediately after the speech, Roth commented about the protests to The Argus. Roth also asserted that the student protestors did not have the same knowledge of custodial workloads as his office did. One protestor acknowledged that they do not possess the same data concerning the workloads of custodians but said that workers’ perceptions of their workloads matter more than SMG’s adherence to industry standards. At 12:15 p.m., students, Physical Plant workers, custodians, and Local 153 Office & Professional Employees International Union (OPEIU) representatives joined protesters for a rally with around 100 attendees. Business Representative for Local 153 Seth Goldstein noted the importance of his union joining the rally despite custodial workers being represented by a different union. The rally protesters continued their chants, and some protesters and a custodian gave speeches. 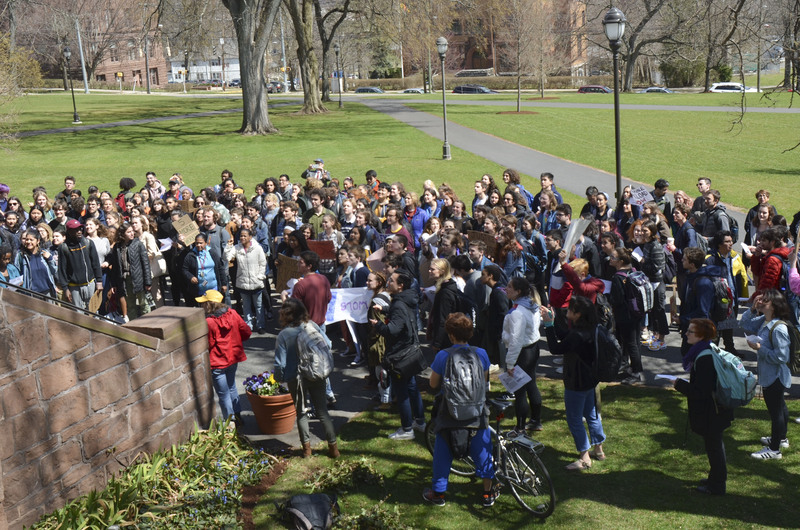 The protesters then marched to South College, paused to chant on its steps, and eventually returned to the Office of Admission’s patio, where they continued chanting until 4:30 p.m.
At 9 a.m. on Thursday, April 11, protesters again gathered at Roth’s welcome address in Beckham, where they began chanting, an escalation of their silent protest the day before. According to a protester present at the event, deans and Public Safety officers told the students that they were risking their status as students and were told to leave. The protesters continued to chant, which prompted attendees to leave Beckham. Roth finished his speech outside the building and did not conduct the scheduled Q&A. At 10 a.m., student protesters went to an Office of Residential Life panel for prospective students and their families. A few minutes into the panel, students began chanting and continued for five minutes until one Public Safety officer arrived and asked them to leave the room. The protesters dispersed, and the officer followed them out. At 11 a.m., protesters then interrupted the Parent-to-Parent Panel at the Powell Family Cinema with more chanting. One of the panelists at the event asked the protesters to explain their cause. The protesters did so, and after indignant responses from several parents and support from others, they continued to chant and were eventually confronted by three Public Safety officers. The officers led the protesters to the parking lot, where they then disbanded. Protesters also returned to the Office of Admission’s patio and continued chanting. They were joined by around 10 prospective freshmen that joined them in holding signs and chanting. At 2 p.m., protesters attempted to gain access to Marysol Castro ’96’s alumni keynote address in Beckham; however, three Public Safety officers, Director of Public Safety Scott Rohde, and a couple staff members prevented the protesters from entering the room. The protesters waited outside, then began chanting. Saying they were being too loud, officers began asking them to leave. One officer grabbed the back of a student’s jacket, forcefully guiding him down the stairs. As the protesters were escorted down the stairs by Public Safety officers, who at times used physical force, they continued chanting until they were ushered out of the building and the doors were locked behind them. They regrouped, then continued chanting outside, directing their demands to the building’s windows and urging those listening to call Roth’s work number to show their support for the protesters. In response to the protests, an all-campus email with the subject line “Disruptions Today” was sent out Thursday evening by Vice President for Student Affairs Mike Whaley. The email said that, while Wednesday’s protests were in line with University policies, Thursday’s protests were not. Despite the threat of disciplinary action, Jamie stated that students will not stop protesting until their demands are met. I hope Roth doesn’t back down on these protestors. If they want to disrupt Wesfest, they should expect to see consequences. And yet they did’t do anything today. The administration is scared. Shame on you for vilifying protesters, custodial workers, physical plant workers, and their unions who keep pointing out Wesleyan’s unfair workloads. You should be ANGRY at Wesleyan for claiming to be egalitarian while they screw over their lowest paid workers, all of whom are people color. The fight continues and Wesleyan will meet out demands.